I love the web because, well, it's so webby, so interconnected, so like my mind. My interests are currently taking me to a very interesting space on the Internet where people are having intelligent and interesting conversations about what math is and how to teach math effectively to children. I am enamoured by all these conversations. I know that I will learn a lot from reading them, and I hope some day soon that this blog will spark some conversations of its own. This is a perfect addendum to my post from yesterday More Than Counting. Right now, I can't even describe the pleasure I feel from reading this statement. I'll save my poetical waxings for another post. 3. Games are to math as books are to reading. Let the kids play games (or make up their own games) instead of "doing math", and they might learn more math. Moving is to math as books are to reading. Let the kids dance (or make up their own dances) instead of "doing math", and they might learn more math. Every once in a while I do a Google search for my name or my program's name, Math in Your Feet. It's instructive and sometimes surprising to find out just how far out in cyber space I am. Case in point, I recently found an undated conference paper by an associate professor from the Institute of Mathematical Sciences and Physics at the University of the Phillippines Los Baños. Among other things, the paper makes a case for "the cognitive and aesthetic similarities between mathematics and dance." Math in Your Feet is cited and described in one of the opening paragraphs. Never mind the fact that it's just a rehashing of promotional language direct from my website, the rest of the paper makes a pretty good argument for the importance and relevancy of integrating math and dance. "mathematics is not about numbers, but about life. It is about the world in which we live. It is about ideas, and far from being dull and sterile, as it is often portrayed, is full of creativity. It is the science of patterns." Within this one quote are ideas I've been trying to communicate for years to the folks who hear about my program and inevitably reply, "Oh, you mean like counting your steps?" I always try to find a nice way to say, no, not really, but there's never enough time to explain my reasoning fully. However, I do have time and a little space here to say mathematics is more than numbers and counting and balancing your checkbook and that a program which teaches math through dance (or dance through math) is about more than counting too. Mathematics is essentially a language invented to describe, manage and understand the physical world. (And if there are any mathematicians checking in on this blog, feel free to correct me!) That's why connecting math to the real-world helps kids better understand it, because the real world is math. And, no matter what your opinion is about dance being lumped in with 'things in the real world', please remember that we all move and without a firm grasp on spatial relationships, one of the foundations of a good mathematics education, you will most literally be lost. That's why even the preschool version of Math in Your Feet has less to do with numbers and more to do with exploring and understanding where you are, where you want to be, and how you're going to get there. Add to that a chance to develop patterns of movement embedded in time as well as make creative choices while moving and you now have a powerful mathematical experience in real time and real space. The critical piece (for upper elementary kids, anyhow -- the younger ones just need as much kinesthetic experience with the concepts as their teachers are willing to fit into a school day) is that kids get a chance to bring the math back to the page. After all, math is a symbolic language, but it is really much more than counting. I'm sure I'll be revisiting this theme in the future. But first I have to run to the library to pick up a couple of Keith Devlin's books. I think about a lot of things, and something I have thought a lot about are transitions. When I teach clogging or step dance I think about how to explain to my students the variations and subtleties of transitioning weight or how to finish one step successfully and move on to the next. My child, who has a regulation disorder, has needed me to pay close attention to the daily transitions/routines in her life since birth. I watch my own reactions to unexpected changes in my concept of what 'should' be happening in my day. I am aware of, mostly after it's already started to happen, the subtle shift of life as it moves from now to past. So it probably won't surprise you to hear that I think about transitions every time I walk into a classroom. When one works with moving kids a transition can be a moment ripe with opportunity or a potential stumbling block, a great teaching moment or a train wreck. I find these moving-while-learning kinds of transitions the ones that require a particular kind of attention and respect. 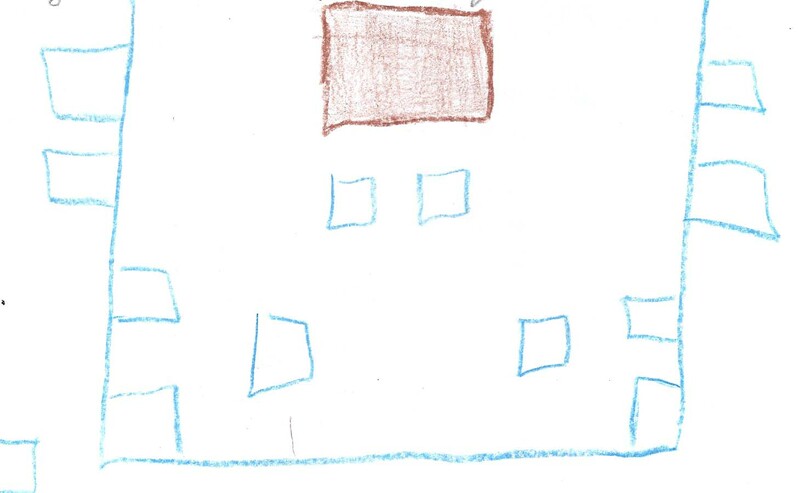 I suppose my approach to classroom transitions stems from my experience as an artist whose medium is space and time. From where I stand, a transition is a moment when you have to simultaneously distinguish between something as it was, as it is, and as it will be. Dancers (and musicians, too) encounter moments when they need to talk with themselves, the choreographer or other dancers about how to move from one moment or step to the next. This attention to detail is just part of the process but its also a process that can be fraught with opposing viewpoints, confusion, and tension over all aspects of interpretation of the moment. And, because dance (and music) exist in such temporal space (meaning here and then not-here in a split second) one usually spends 1000 times more time working out the transitional moments than actually performing them. When resolved, the agreed upon transitional moment can be a thing of beauty, a seamless moment of artistry. In my role as a dancer and a musician, dealing with transitions are part of the job. In that particular context, if transitions don't get a certain amount of attention or respect all you'll end up with are unconnected pieces of movement or sound devoid of form or meaning or, at the very least, lacking the quality you would desire. It's practically the same experience for me when I bring my art into an academic setting. I consider teaching (whatever the subject) the art of working in time and space to organize, focus and energize multiple bodies and minds. If I walk into our dance space with my lesson plan but have paid no attention to the spaces between the bullet points, it is highly likely that my day will be quite unsatisfactory, perhaps even, as I said above, fraught with opposing viewpoints, confusion, and tension over all aspects of interpretation of the moment. That sounds heavy, but just how do you stop bodies and ideas in motion? The child's choice to pay attention is just that -- a choice. It is, of course, expected that in school you pay attention and follow directions, but what if you are paying attention, just that all of your focus and intent is on what your feet are doing? My own daughter gets so caught up in her projects that we continually have to strategize on ways to disengage her from her work when it's time for school, or dinnertime, or bedtime. This is all to point out that transitions can be HARD, especially if you're emotionally invested in what you're doing now and are still in the now even when it's time to go to the next thing. Me working the "Countdown to Silence"
Just telling a moving kid to sit down and expecting them be instantly ready to focus on verbal or visual directions is a hit or miss strategy, if you don't mind me saying. A moving body needs a few focused seconds to calm itself down and turn on the eyes and ears. Because I value the power of a group making rhythm together, I created a simple rhythmic countdown (which you can learn for yourself if you ever happen to see my work) which seems to do the trick. It brings the whole room back to focus. Kids can find their center even while sitting. 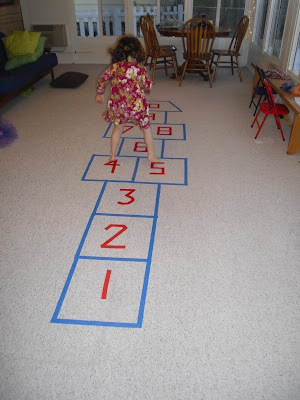 This countdown is a simple verbal and physical rhythmic reminder every time we transition from moving to sitting and is usually enough to help kids get ready to bring in new information. This kind of transition also helps to maintain consistent composure of the group over the course of the lesson. Sometimes, if you just pay attention to and clarify the intent of a moment, especially an in between moment, the solution will be waiting. A philosophical yet potentially useful mindset. For most of my career as a teaching artist I have had to travel hundreds of miles to get to work. I'd spend a lovely week in some beautiful part of North Carolina, South Carolina or Kentucky and then drive home. I loved the opportunity to work with all kinds of kids, but inevitably I'd miss my own bed and let's not even mention doing insane things to stay awake on the drive home after a busy week away (wasabi peas, anyone?). Even now, having temporarily limited my travel closer to my current home, I usually 'only' go as far as the north side of Indianapolis and back in a day, and that's still three hours round trip from Bloomington, IN. I have performed in Bloomington, but I have never worked in my capacity as a teaching artist here. It is a fabulous town, full of arts and culture of all kinds with the Lotus World Music and Arts Festival being one of my favorites. Indiana University is also a mecca for arts and culture, including the Jacobs School of Music and programs like the Department of Folklore and Ethnomusicology. If you go hear to a show headlined by a 'local' musician, chances are that person has a thriving regional or national career, or is good enough to be considered for one. Even without considering all this talent, Bloomington is truly a caring, involved and creative community. Indiana University's ArtsWeek! 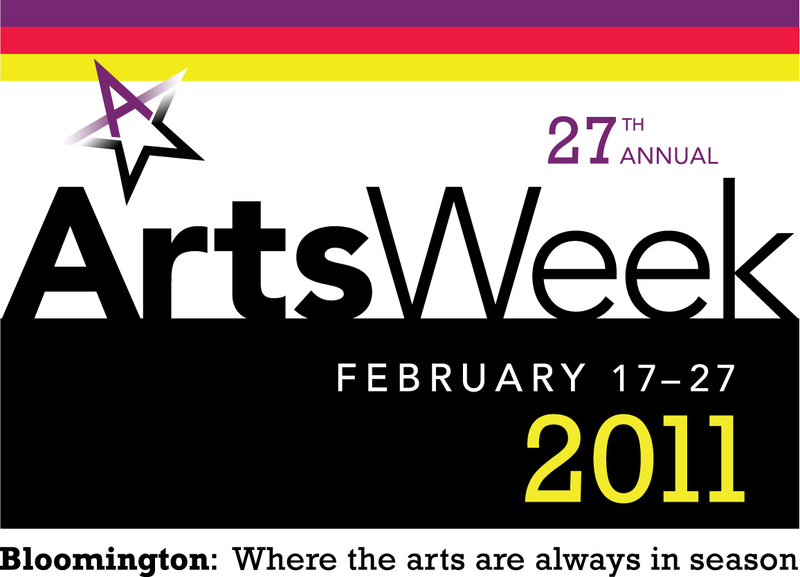 This year's theme is ArtsTeach and I'm completely honored and excited to have been one of the projects chosen for the 2011 ArtsWeek celebration. In February, I'll get to drive approximately FOUR MINUTES down the street to Templeton Elementary School. And when I'm done with my work, I'll drive four minutes back home. Amazing. I realize I probably sound more excited about the reduction of my commute than anything else, but I should assure you that I am thrilled beyond words to be able to bring Math in Your Feet into my own community. In my collaboration with Templeton Elementary School, and their PE teacher Monica Chapin, we'll be offering a week-long residency, a family night focused on creative problem solving, and a no-holds barred traditional American music and dance performance to the Templeton ES community. MY community. I'll get to work with kids I have probably seen playing at Bryan Park after school, or in the audiences at the Farmers' Market when I busk there in the summer, or playing basketball at the Y, or whose teachers have taken a Zumba class from me. There truly is no place like home and I, for one, am thrilled at this opportunity. Thanks IU ArtsWeek! Milk carton cube, rectangle tray. My snack at home after school? So much of what we know about how the brain learns points to using all the senses -- moving, touching, smelling, looking, leaping, running, talking, writing, tracing, solving, thinking, responding, producing, revising, doing. What about a moment of doing nothing except making your body balanced and quiet, ready for learning? In Math in Your Feet we call it 'finding your center.' This means, quite literally, to stop what you're doing and put your two feet in the middle of your square dance space. Arms by your sides. Eyes on the teacher. Mouth quiet. In control and in charge of your body. Ready and waiting for the next thing to happen. One of the biggest concerns teachers have about bringing kinesthetic/movement/dance learning into their classrooms is that it's going to be chaotic and uncontrollable. I hear it every time I lead a professional development session for teachers. By the end of our workshop, however, they realize that just because it's movement doesn't mean that self-control is absent. This is something I bring up with kids, as well. Continuing to return back to your center is one of the ways that you can remind your body what it feels like to be in control. And then, you are ready to move again. Movement is crucial to helping children learn, even if it just means there is time in the day to get up and move around the classroom. However, when you are using a lot of movement, children need stillness to counterbalance all the activity. This idea is worked into the flow of each class I teach in an academic setting. My formula has always been 3-5 minutes of moving, followed by 3-5 minutes of sitting and focusing on other things -- watching and responding to others' creative work, receiving information, clarifying content. This kind of non-moving time, coupled with 'finding your center,' becomes a powerful counterpart to all the jumping, sliding, stepping, turning, talking, collaborating, resolving, and creating the students do the rest of the time. Whether you're a teacher, a teaching artist, a dancer or a parent (or a combination!) I'd love to hear what you think about the topics in this blog. Please consider sharing your thoughts and ideas in the comments sections or by sending me an e-mail. I hope to hear from you! I am a traditional percussive dancer (Appalachian style flatfooting and clogging and Canadian step dancing) who has spent a lot of time learning about all the math that relates to percussive dance, with the support and help of master educator and friend Jane Cooney. I have also spent years figuring out which areas of math make the best fit with my art form. I am not a math teacher, but I do teach math. Is this creating some cognitive dissonance for you? I did for me too. I had to think about this a lot before I could finally come to peace with that statement. I teach the math that directly relates to the process of making rhythm and patterns with the feet. When talking about integration I should first mention that there are a few different models for arts integration out there. The Chicago Arts Partnerships in Education (CAPE) has a really effective model, one they've written about in a wonderful book called Renaissance in the Classroom: Arts Integration and Meaningful Learning. In this model (as I understand it) there is a classroom teacher (the academic content specialist) and an artist (the arts specialist) working together to find an 'elegant fit' between two different content areas (academic and arts based), but taking turns sharing the instructional time. In my case, I worked with a math specialist (Jane) to build the program but it was my job to bring the dance/music content and the math content together in cohesive way during the instructional time. Essentially, I was the one to teach the dance, the related math, and the connections between the two. I am not a math teacher, but I build a bridge to math. 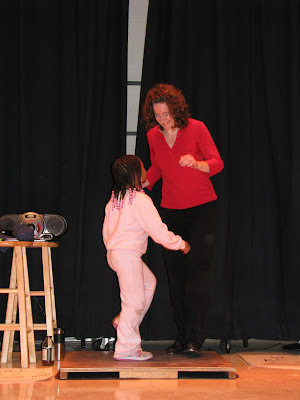 I may be the one who makes the connections between the dance and math clear for the students, but their classroom teachers also have an important role both in the dance workshops and back in the classroom. In order for the math understanding that emerges during dance class to stick with the students there are two things that need to happen. First, the classroom teachers need to be present and observing their students' efforts. 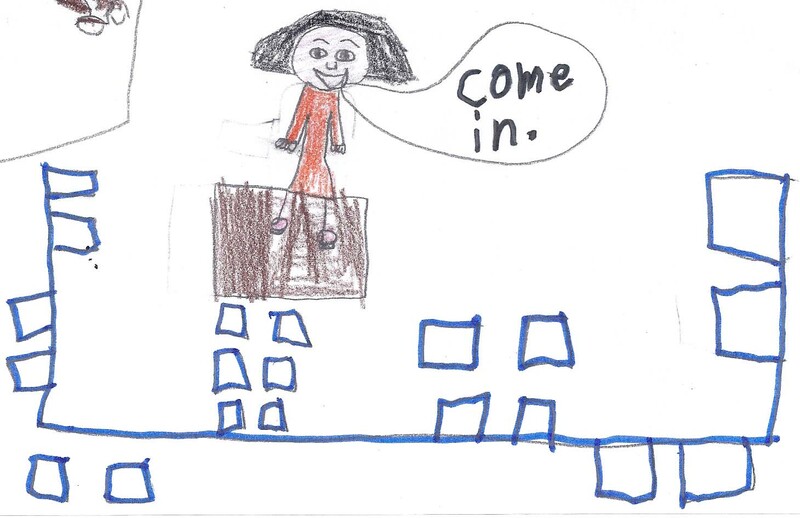 Teachers do not have to dance, but they can still help the kids iron out any rough spots during their creative work. Teachers are also learning about the connections as the week progresses. 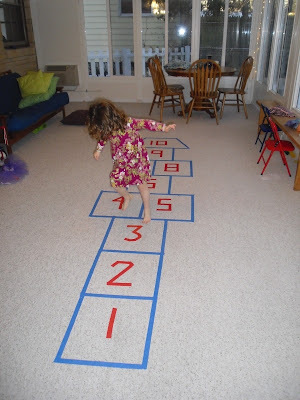 Second, if the math instruction that I am offering is going to have any lasting value, the kinesthetic learning needs to come back to the page. ...and then I hand them back to their teacher! Back in the classroom, the kids open their specially designed workbooks and reflect on their activity and learning through daily journal prompts. They have a daily word study section to explore their perceptions of the new vocabulary they are learning. They also find more recognizable 'math problems' on those pages which relate to and extend the math they learned in dance class. For example, their personal dance spaces are 2'x2' squares. 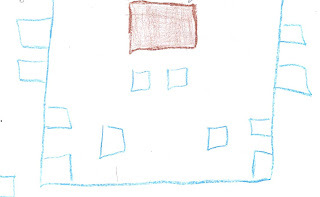 In their workbook there is a page that asks them to create a scale drawing of their dance space on the page. I love the relevance of this! So, there you have it. I am not a math teacher, but I am a bridge builder. Through the process of revealing the connections between two seemingly disparate subjects, I am able to illuminate certain elementary math topics in new and meaningful ways. Tah dah! To start, you need to SEE it. You've probably been looking at squares all your life. You can correctly identify a square and find examples of it in your environment. But do you really understand it? Possibly. You might be able to give some facts about a square (number of sides, number of vertices, measurment of angles, etc.) You may even be able to draw one or all four of the lines of symmetry through square. But if you're a fourth grader being asked to make your body execute a move on the diagonal (opposite corners), it's actually pretty hard for you to do that without a visual reference. That's where tape comes in. So, LOOK AT your taped 2'x2' square on the floor and sit inside it. Use your fingers to TOUCH and TRACE the parallel sides, the vertices, and the equilateral sides. TOUCH the directions forward, back, left, right and all the diagonals, and while you do this SAY the words that identify where you're touching. By now, it's probably safe to say that you are oriented to your two-dimensional dance space. It's also likely that you have become inordinately fond of this little piece of property you call "home" and are unwilling to let anyone usurp your territory. Ah, to be nine again. No matter, it's all good. "...just as important to our development and our lives is the integration of sensory input, which gives us information about gravity and motion, and about our body's muscular movements and position in space -- the vestibular system and proprioception. These play a surprisingly significant role in our awareness of the world and also...in our ability to understand and learn." Okay, so now it's time to STAND UP and utilize your body for some high powered learning. Put your FEET TOGETHER and STAND in the center of your space. JUMP forward, JUMP center, JUMP back, JUMP center. SPLIT your feet to the sides of the square. SPLIT your feet to the diagonals. TURN your body right, towards the first side. TURN toward the next side. TURN toward the third side. TURN toward the fourth side. How many times did you have to TURN to get all the way around? How far, in fractions, did you JUMP on each turn? How far was each turn in degrees? If you JUMP and TURN half way around your square, how far have you gone? How many jumps will you need to get all the way around? If you start your movements facing forward, JUMP and TURN 90 degress to the right and then JUMP and TURN 180 degrees to the left, where will you end up? Are you learning anything new from a square yet? Communication is one of the main themes of Math in Your Feet. During the program students learn how to communicate with the language of rhythm and patterns in their feet. They also learn to communicate their original dance patterns using math vocabulary and by mapping their patterns on a coordinate grid. Communication is a two-way street: if you want kids to learn how to communicate well, it's important to listen to what they have to say. I'm a big fan of listening to kids (except when I'm in the middle of making dinner, I suppose). Here are some pictures of me having a rhythmic conversation with a young friend. It's an amazing feeling to have a satisfying conversation like this one without using even one spoken word. 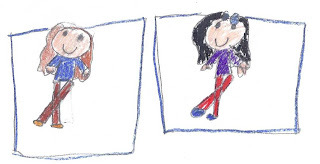 I'm always heartened and inspired at how much children have to say. Teaching Below the Surface: Harnessing the Power of Tape! In earlier posts I espoused my enthusiasm for using simple floor tape to manipulate an environment and encourage physical exploration of that environment. It's a powerful tool for teaching below the surface, something that makes a bigger impact when you don't talk about it because it's just there. The Reggio Emilia approach says that environment is the third teacher and I have found this to be true in my work. How I set up a learning environment can have a large impact on the students, and I have pictures to prove it! In my work with elementary students we have a group dancing time to warm up and learn clogging, a little each day until they have some mastery of basic steps by the end of the week. The bulk of our class time, however, is spent with partners engaged in creative work. This effort is done in what I call a 'personal dance space': a scaled down version of the portable square dance platform on which I teach and perform. Mine is wood, theirs are tape. Mine is brown, theirs are blue. Mine is three dimensional, theirs is two dimensional. Mine is 3'x3' and theirs are 2'x2'. Did I mention I love floor tape? On the first day we work exclusively as a large group and the tape on the floor in our dance space is a simple three-sided rectangle. The kids line up with their toes on the tape and face toward the center of the space. This way everyone can see me and what my feet are doing. By the second day of our work together I've managed to tape out about 15 pairs of blue dance spaces. Inevitably, on that day the kids walk into the room and, knowing nothing about what is going to happen in our class later, they go directly to a box and sit down. I have to redirect them to the large-group perimeter tape but there's something about having a space of one's own, and these boxes just pull them in. We never talk about the set up of the room, but since we focus quite a bit on transformation and symmetry in this program I try my best to make sure that, if asked, I can draw an accurate line of symmetry down the middle of our dance space. 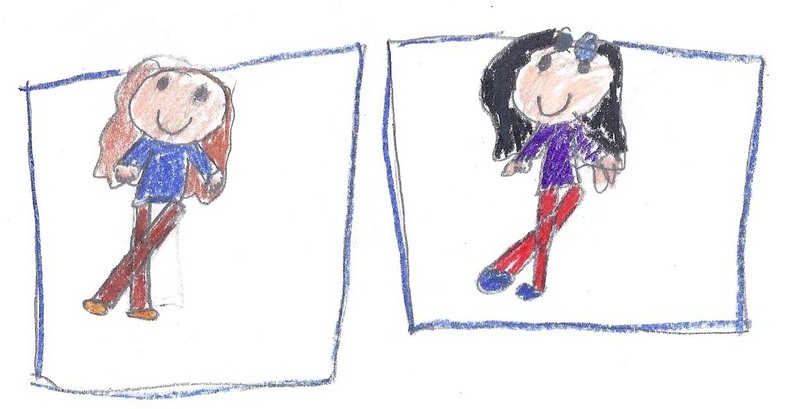 So, without further ado, here are some drawings done by fourth graders as part of a Thank You letter project their teacher had them complete at the end of the residency. No one told them what to draw. I'm obviously very welcoming! 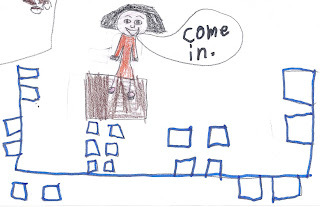 This was drawn from memory, back in her regular classroom. Notice the basic symmetry of the space. This isn't exactly what the room looks like (not enough squares), but you can draw a perfect line of symmetry from top to bottom of this picture. One of the other 'below the surface' learning tools in the program is that working with a friend and sharing ideas can lead to amazing results. Not only are these two girls dancing together (and smiling), they're dancing in a space delineated by blue tape! I would like to point out that we're all creative on a daily basis. I never quite know what to say when someone tells me just how creative I am (and, reading between the lines, how not creative they are) as if creativity exists only in the realm of art making or that it's something that happens for just a few, select people. I also consider creativity and problem solving to be synonymous -- a series of actions and decisions made towards the goal of solving a problem, whether that problem be finding a cure for cancer or formulating ideas that end up as paintings in galleries or a concert on a stage. 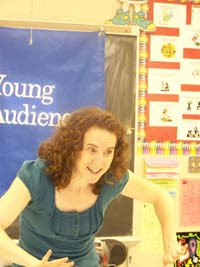 In Math in Your Feet (elementary version) kids make up their own percussive dance patterns. While we're engaged in this process I make the point that 1. both problem solving and the creative process usually don't occur with one action, but with a series of actions and choices that bring you to a solution and 2. sometimes, if things aren't going the way you'd like, you have to revisit a previous step of your process to refine or redirect your ideas. 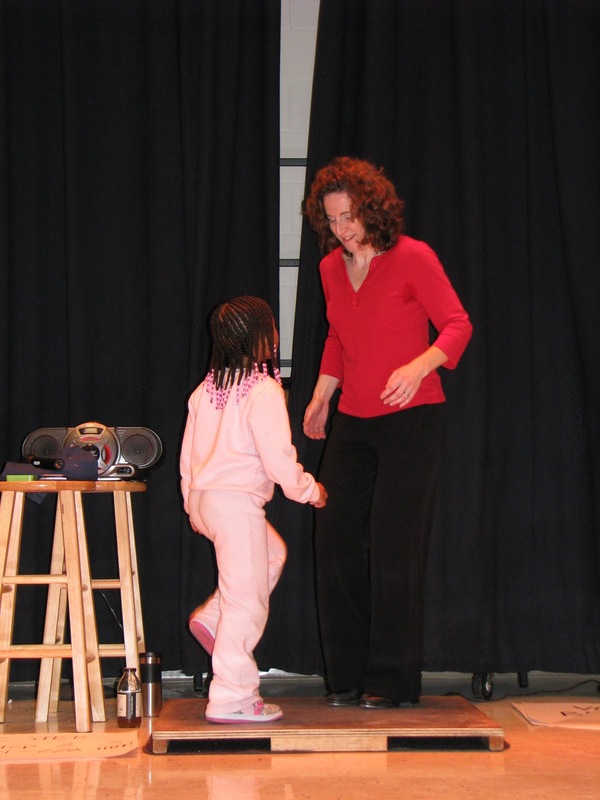 One of the other things kids experience in Math in Your Feet is the difference between choreography and improvisation. Choreography is usually the end result of a lot of improvisation -- trial and error and trial again. There are a lot of choices and decisions you have to make a long the way. Sounds a lot like problem solving to me. So, we are all creative, on a daily basis. We all have multiple opportunities throughout the day to identify a need, make choices, and strategize about what to do next. Not every problem needs to big and not every solution needs to be a work of art or cure cancer for us to engage daily in this wonderful process. It's still the same recipe, but different, and it suits my tastes and my needs. I'll never be considered a gourmet (there are many, many better cooks out there than myself) but when I cook I feel a sense of my own mastery. My food is the direct result of my choices, for better or worse. If I don't like what I made, I get to try again to make my dish more the way I'd like it. That's why helping kids create their own dance patterns is so satisfying for me. Once I figured out how to provide just the right amount of structure (which is really the topic of a future post) I found that kids had lots of ideas and were really excited to try them out, with only a minimum amount of struggle. And, surprisingly, they were all happy at having a chance to solve a problem (a choreographic one, with limits, but still a lot of freedom for personal choice). We are all creative, on a daily basis. Maybe not in the kitchen or in a dance class, but in some other venue. What's yours? A few years ago I went to the Indiana State House in Indianapolis to view "The Hundred Languages of Children," a travelling exhibit about the Reggio Emilia approach to early childhood education. If you're not familiar with this approach it, among other things, considers the environment (of the classroom, and other spaces) as a 'third teacher'. Of course, I was drawn to the part of the exhibit that focused on movement and dance as one of the "hundred languages" with which children express themselves. There was a video that showed the children's first experiences with an old factory space-- a huge room empty except for two rows of large, white columns. The children were running around and between the columns, peeking around them, and interacting with their friends, all movements and ideas that eventually turned into a formal piece of choreography. At the time I was just starting to think about creating a math/dance program for preschoolers and my biggest question was how could I encourage that kind of exploration? It seemed unlikely I would be able to find an empty factory or other interesting environment and get a bunch of preschoolers there on a weekly basis. And then it hit me -- I could create an environment out of tape. I could define three-dimensional space using two-dimensional lines and colors. By way of explanation, when I say 'floor tape' I am referring to two different products, both of them sticky. First, there's painters' tape which is blue and low tack so it can come up easily off both hard surfaces and carpet (except when kids poke their pencils into it and it gets perforated, but that's a different story.) There is also the floor tape that P.E. teachers use, which comes in lots of fabulous colors, the better to design with, my dear. Straight Lines, Part 1: A simple straight line taped down a hallway becomes a pathway. It also divides the space in two, and provides a chance to walk on it or jump over it. Best of all, one can march (or walk, or skip, or slide, etc) rhythmically down it singing "As I was marching down the street, down the street, down the street..."
Straight Lines, Part 2: When my daughter was three her teachers put down a straight line of tape to help the class 'line up' before leaving the classroom. A simple, visual learning strategy. Later in the year I saw pictures of what else the kids had done with the line. They had used their large blocks to build a wall the length of the tape and then lined up their animals and cars alongside it. A wonderful example of how a simple alteration of a child's environment can deepen their experience and exploration of the space around them. Floor tape can define and redefine the space it's in. Large open spaces encourage a lot of endless running. The minute you create a large rectangular box on the floor, with corners, you can now have enough of a visual to focus a preschooler's attention to IN (the box), OUT (of the box), AROUND (the sides of the box), CORNERS, and ACROSS, all age-appropriate math terminology. A simple taped perimeter can highlight empty space, as in "Find an empty spot inside the tape and make a shape." Tape two or more parallel lines down a space and see what happens when you sing "Down by the banks of the hankey pankey, when the bullfrogs jump from bank to bankey..."
Ultimately, I would love if every preschool teacher would just put down taped lines in their classrooms and then stand back to observe how the children interact with them. Start with one straight line and go from there. Let me know if you want to talk further about this idea -- I'd jump at the chance to see how far we could take this. I was reading my daughter the book The Trumpet of the Swan by E.B. White this week when I found this passage. In my mind, it makes a strong statement for accepting the fact that there is usually more than one right answer, and that kids need meaningful, real-life experiences to make them effective and enthusiastic problem solvers. Just as background, the character Sam is a born naturalist who spends many hours in nature, walking and observing the life around him. Back in his own room, Sam sat down at his desk...their teacher, Miss Annie Snug, greeted Sam with a question. "Sam, if a man can walk three miles in one hour, how many miles can he walk in four hours?" "It would depend on how tired he got after the first hour," replied Sam. The other pupils roared. Miss Snug rapped for order. "Sam is quite right," she said. "I never looked at the problem that way before. I always supposed that man could walk twelve miles in four hours, but Sam may be right: that man may not feel so spunky after the first hour. He may drag his feet. He may slow up." Albert Bigelow raised his hand. "My father knew a man who tried to walk twelve miles, and he died of heart failure," said Albert. "Goodness!" said the teacher. "I suppose that could happen, too." "Anything can happen in four hours," said Sam. "A man might develop a blister on his heel. Or he might find some berries growing along the road and stop to pick them. That would slow him up even if he wasn't tired of didn't have a blister." "It would indeed," agreed the teacher. "Well, children, I think we have all learned a great deal about arithmetic this morning thanks to Sam Beaver..."
April 12-16, 2004 was an exciting week for me. The idea for this new program, Math In Your Feet has been germinating since I developed my first arts in education program, Rhythm & Dance (now called Drum With Your Feet!) back in 1997. Over the years, as I gained experience working students, identified the what was important to me about my art form, and created study guides and extension activities to help solidify the dance and social studies concepts within my residency, I could just tell there was math in there somewhere, and the idea excited me. I always wanted to understand math but there was only one time in my entire life where I actually did. It was during my senior year in high school, in pre-calculus. It was a grey day in western Oregon and I was sitting over my textbook completely confused. My teacher came over to help me, and all of a sudden I felt as if the sun was shining over me, full and bright -- I had grasped the larger meaning. But in a moment, the clouds came back. Over the years, I have held onto that experience, and used it as a beacon, knowing that there was hope that one day I would, and could, "get it". On Day Two of this first pilot week of Math In Your Feet! I wrote in my notes, "I can see the excitement in the kids when they see what they already know [about math] being used in this new situation." That's what Math In Your Feet is: A crossroads, connecting previously unrelated ideas together to create a place of deep understanding, if even if for a moment. In my mind, the connections are everywhere. Thinking and dreaming and problem solving can occur using any language, whether it be spoken, or in your feet using the pattern of rhythm and movement, or in math. At the end of this pilot week, one girl said to me, "I didn't like math, and I still don't, but I like it more." I believe she "got it" this week -- that at some level, I was her ray of sunshine in an otherwise cloudy part of her mind labeled "math."